Favoriting files is a practice many photographers and videographers have adapted to their workflow for efficiency. It allows you to denote the files you deem “worthy” of editing and easily locate them at a later time. How do I Favorite photos and videos? With GNARBOX, marking your favorite photos and videos is easy. Favorites can be chosen from files saved on the GNARBOX already, or they can be added directly from a device like an SD or microSD card. Open the photo or video you want to favorite, and simply hit the Favorites star icon at the bottom of your screen. Alternatively, swiping up in the File Preview screen will also mark that file as a favorite. This will automatically add the selected image to your Favorites folder. To batch select favorites, make sure you are viewing your files in Thumbnail view. 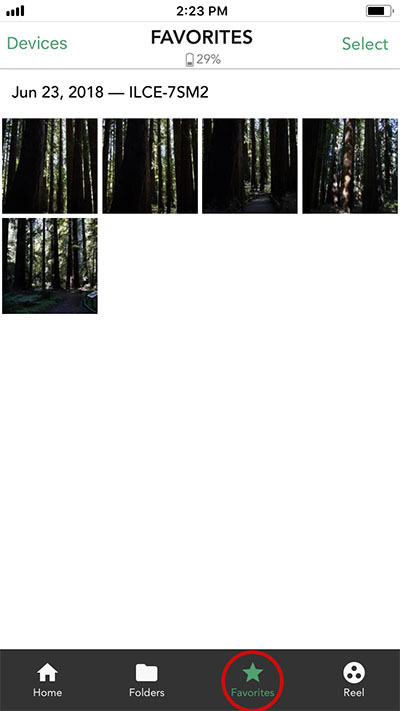 Tap "Select" in the upper-right corner and click the photos you wish to favorite. Then tap the Favorite star icon at the bottom of the app. To unfavorite a file, preview the file you wish to remove. Simply tap the "Favorite" star icon. You will be notified that the file has been removed from your favorites. To access all of your favorites at a later time, tap the Favorites star icon on the bottom of the home screen.